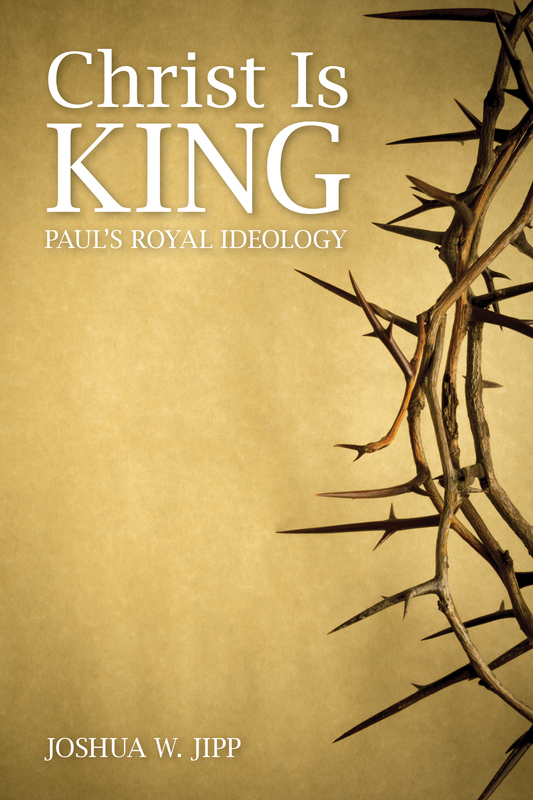 I have thoroughly enjoyed reading Joshua Jipp’s new book on Pauline Christology: Christ is King: Paul’s Royal Ideology (Fortress Press, 2015). It is a wide-ranging study, full of creative new interpretative suggestions and it overlaps at one critical point with the argument I develop in Jesus Monotheism. The standard modern scholarly view has been that Paul’s word “Christos” is simply a personal name for Jesus. It does not evoke any messianic ideas. It is not a title. Matthew Novenson has recently argued in his influential study (Christ Among the Messiahs (Oxford University Press, 2012) that actually “Christos” is an honorific title, that does (at least sometimes) have messianic connotations. Jipp builds out from Novenson’s thesis, in several new directions, to argue that swathes of Paul’s letters can now be explained on the theory that Paul uses the word “Christos” to mean “king”. At critical points—at the start of Romans for example (Rom 1:3–4)—Paul signals that “Christ,” the son of God, is the royal messiah of scriptural expectation. Christ’s rule as resurrected king over his subjects creates new political communities (his churches) whose identity and pattern of life is defined by their salvific participation in and conformity to his representative, sovereignty (chapters 4–5). Paul also makes a distinctive contribution to the development of early Christian thought by sometimes evoking Greco-Roman ideas about the ideal king (in the neo-Pythogrean peri basileia texts, for example). This provides a new explanation of the (otherwise puzzling) expression “law of Christ” (1 Cor 9:21; Gal 6:2) (explored in chapter 2). The part that interests me most is chapter 3 in which Jipp applies his overarching thesis to the worship of Christ that we find in the hymns in Phil 2:6–11 and Col 1:15–20. Jipp takes up the important work of William Horbury—especially his Jewish Messianism and the Cult of Christ (SCM, 2015)—to argue that this worship of Jesus as a divine figure is somehow indebted to both scriptural texts where the king is divine and to Greco-Roman beliefs about the ideal, divine, ruler. This is a provocative thesis challenges the important work of Larry Hurtado and Richard Bauckham who have dismissed the possibility that biblical and pagan kingship traditions actually help explain Pauline Christ devotion. I hope it will breathe new life into debate about this most important historical (and theological) subject. I notice that on this issue there is some overlap between Jipp’s argument and the one recently put forward by David Litwa (in his Iesus Deus)—which I discussed in an earlier blog post. And I am encouraged that on several key points Jipp’s argument overlaps with my own. The need now to give more attention to the role of Greco-Roman traditions when interpreting NT Christological texts. Horbury’s seminal work in this area has perhaps sometimes been undervalued. As he and Jipp show, there is a lively interaction in pre-Christian Judaism with the long and rich tradition of Greek and Roman philosophical debate about the nature of kingship. So it is likely that as a messianic movement Christians continued that interaction in their Christological thinking. Christ is portrayed as the ideal divine ruler in Phil 2:6–11 + 3:20–21 and Col 1:15–20. The Phil 2 hymn has “an imperial Christology” (P. Oakes). Such texts can only be fully understood when we immerse ourselves in both OT kingship texts and the cognate pagan texts. Point 2 suggests those pagan traditions were a contributing factor towards the early Christian treatment of the risen and exalted Jesus as a divine figure. This matter needs fresh investigation. (In his Conclusion Jipp seems to hedge his bets on this possibility). At the same time, aspects of Jipp’s argument are unconvincing or problematic. In Jesus Monotheism, Volume 1 chapter 6 I laid out some criticisms of Horbury’s thesis that apply equally to Jipp’s arguments. In essence, I think Jipp overstates the role of biblical and pagan kingship texts in the formation and formulation of NT Christology. In important ways, Christ’s divine identity—as the eternal Son, the co-creator-become-incarnate-in-Jesus-of-Nazareth—is quite unlike anything that we find in OT texts describing a “divine” king. Those texts do not explain Paul’s remarkable identification of Christ with Yhwh-Kyrios. I will argue in chapter 8 (in volume 2 of Jesus Monotheism) that Phil 2:6–11, 3:20–21 is a profound critique of the pagan ruler cult. But this material in Philippians is somewhat exceptional in the Pauline corpus (the connections to the pagan material are weaker in Col 1:15–20). I am not convinced that the OT texts go quite as far in ascribing to Israel’s king a divine identity as Jipp supposes. For example, as I point out in Jesus Monotheism volume 1, the Hebrew Bible is actually careful to avoid saying that the king has God’s own divine glory. Also, it is not for nothing that Paul never actually refers to Christ as a “king” (basileus). (According to Acts that is an outsider’s perspective on his beliefs about Jesus—Acts 17:7). And it is striking that the few OT texts that do explicitly speak of the king in divine terms are almost entirely missing from the NT and are nowhere cited or echoed in the Pauline corpus (Isa 9:6; Ps 45:7; 1 Chr 29:20, cf. Isa 11:1–4; Num 24:17; LXX Ps 71:11). This picture accords very well with the evidence of the gospels wherein the view that Jesus is a “king” is at best a partial recognition of his real identity and, at worst, a serious misunderstanding of him (Mark 8:27–9:13 and parrs; Mark 14:61–62 and parrs; John 6:15; 18:33–37). Also, a thorough investigation of the role of Jewish “messianic” beliefs in the formation of a divine Christology needs now to consider the role of ideas surrounding the high priest “messiah”. For Jipp “Messiah” only means king. He gives no space to the evidence that for many first century Jews it meant (royal) high priest. Thanks so much, Crispin, for taking the time to read and give a few comments on my book and show where our projects intersect with one another. Though you did not expand on this point of agreement, I’m glad to see that it appears we are in agreement with respect to positing Philippians 2:6-11 and Colossians 1:15-20 as depictions of Christ as an ideal divine ruler. That these two texts are royal encomia, that they function to bestow praise upon Christ as the messianic king, and that the topics for which he is praised correspond with many aspects of ancient kingship ideology are really the burden of my chapter three. This is also an important first step, in my view, in understanding Paul’s conceptualizing of participation in Christ as sharing in the rule of the Messiah (see ch. 4). 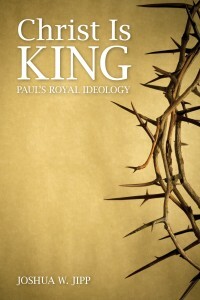 So really the entirety of Christ is King is an attempt to explain some important aspects of Paul’s Christ-discourse as originating from reflections upon Jewish messianism and Greco-Roman kingship scripts. I do consider, however, as you note, the possibility and likelihood that one significant component in the origins of NT Christology is messianism/kingship discourse. Before I expand on this, let me say that I am, by and large, in agreement with Bauckham, Tilling, Hurtado, Bates, you, and others who argue for an early Christology that is simultaneously high and compatible with monotheism. But I’m not convinced they have given a convincing explanation for where this high Christology comes, that is, a set of factors and influences that enable Paul and others to articulate this high Christology. I still need more time to consider your own work here! In important ways, Christ’s divine identity—as the eternal Son, the co-creator-become-incarnate-in-Jesus-of-Nazareth—is quite unlike anything that we find in OT texts describing a “divine” king. Those texts do not explain Paul’s remarkable identification of Christ with Yhwh-Kyrios. I think I say something quite similar: “The claims that Christ is the creator of all things (Col. 1:16), temporally before all things (1:17a), was chosen to have all the divine fullness dwell within him (1:19), and the agent who has produced cosmic peace and harmony (1:20) are indeed remarkable, complicated, innovative, and cannot be accounted for by simply pointing toward one religious context or background” (Christ is King, pp. 136-137). I try to be as clear as possible in my language to guard against the notion that would suggest that I’m arguing that the OT ascribes divinity to the king (as you say I do). So throughout my section on “The King Shares in Divine Kingship” (pp. 150-160) I argue “Israel’s Scriptures portray God electing, anointing, and exalting David…to participate in God’s kingship as his earthly ruler. The king is, then, simply a human who has, through God’s election been called to participate in God’s divine kingship” (p. 160). The relevant footnote indicates: “The king is not divine, but rather shares in God’s divine kingship through covenantal election, participation, and receipt of God’s spirit” (n. 76). Nevertheless, with this caveat firmly in mind, I think that messianic/kingship discourse is one incredibly important factor that has not received near enough attention in attempts to give a historical description of the origins of NT Christology. *receives the honorifics of “Yahweh’s anointed” (1 Sam. 16:6; 24:7, 11; 26:9, 11; 2 Sam. 19:22; LXX Pss. 17 :51; 88:39, 52; 131:10), “Lord” (LXX Ps. 109:1), “Son of God” (LXX Pss. 2:7; 109:3; cf. 2 Sam. 7:12-14), and God’s “firstborn son” (LXX Ps. 88:27). The NT presents us with a figure spoken of as “Lord,” “Messiah,” “firstborn Son,” and “Son of God.” This figure is spoken of as elected by Yahweh. He is exalted to God’s right hand, shares in God’s rule, and is marked out as sharing in and bestowing God’s pneuma. And he receives divine honors and worship. Paul and many NT authors explicitly indicate that they are drawing upon Israel’s Psalter as one conceptual resource for explaining the identity of Israel’s Messiah. So with respect to the Christ-hymns, I say: “What could be more historically plausible than the early Christians reflecting upon the identity, resurrection from the dead, and powerful redemptive work of Messiah Jesus in light of the claims made for Israel’s kings in the psalms, many of which resonate with Hellenistic-Roman kingship ideology?” (Christ is King, p. 136). I hope it’s clear that they way I’ve worded this indicates that Jewish messianism and Greco-Roman kingship language does not explain the origins of the worship of Christ. But I do think and suggest that it is the most important historical-religious discourse that provides Paul with the language of articulating what he wants to say about Christ. I hope at some point to provide a more thorough treatment of the relationship between messianism/kingship discourse and the origins of Christology. To give one non-Pauline example, I find it suggestive that the author of Hebrews uses Davidic kingship language to speak of the eternal Son (Heb. 1:1-3 – not explained by kingship language) as God’s Son, who shares God’s throne, and sits at God’s right hand. The author indicates explicitly that he’s drawing upon messianic language of the Psalter. So after reading one chapter of Hebrews, it’s clear (at least to me) that the author has used Davidic kingship language to describe the identity of Christ but he has done so in such a way (1:1-3!) that goes beyond what the biblical texts described. It’s of further interest that the author of Revelation uses well-known Jewish and Roman kingship tropes to describe Christ as the conquering Davidic king (e.g., 1:13-20, 5:5ff; ch. 12, ch. 19). Thanks again, Crispin. I am looking forward to reading your volumes soon, and I regret that I was unable to benefit more from your work before Christ is King went to press.